Specific Music returns this week with a brand new single from the prolific Following Light. I’ve remarked before about the amount of projects the Russian artist is a part of and he does it with remarkable consistently. 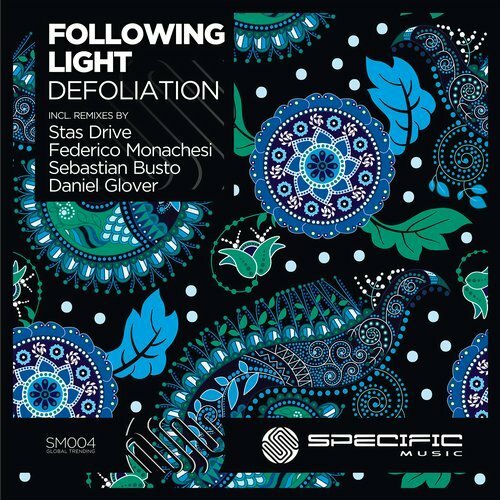 Now making his debut on Specific Music Following Light presents his latest single entitled ‘Defoliation’ alongside remixes from Stas Drive, Federico Monachesi, Sebastian Busto and Daniel Glover. Following Light’s progressive minded sensibilities are loved buy the old school underground and ‘Defoliation’ sits nicely alongside his all time best work. From its dark and grungy groove to rugged rhythms and stellar effects there’s a bevy of sonic delights to tantalise the mind. What’s most appealing though it’s ever evolving storyboard of haunting melodies and melancholic motifs. It makes for an enchanting eight minute journey and one that will certainly sit with you long after. Label boss Yegor Tsarkov has put together a large and amazing remixer cast here with Stas Drive leading the way. It’s been the best year on record for the Ukrainian artist with a full gig schedule and releases on Chapter 24 and Soundteller Records. Here Stas radically revamps ‘Defoliation’ into a deep, dreamy and wonderfully ethereal beauty. The emotional depth is quite astounding and what really sets it apart is how it plays out over a groove that’s ultramodern and thus floor friendly. Next up Federico Monachesi returns to the label for his second appearance following his ‘In The Shade’ EP from September of this year. He’s provided another superb remix here taking ‘Defoliation’ into progressive minded territory with a tighter, more compact framework and a lovely rework of the melodic themes. It’s comes off more hypnotic and contemporary for the genre as a result which sits nicely alongside the original. Sebastian Busto has been one of this year’s most pleasant surprises. The progressive house diehards have been calling for new music from the talented Argentine and he delivers something very tough and drum driven here which still hits a great emotional chord. Making full use of the main motifs Sebastian brings all the feeling of the original and more with additional pads and effects. Closing the release out is Daniel Glover who is also making his label debut following great releases on Soundteller Records and Electronic Tree. The UK artist slows the tempo just a touch for a deep and poignant interpretation that focuses more on the atmospheric aspects. Long sweeps leave a trail of sonic dust as the melodies burrow further into the subconscious with each passing loop onwards to a great finale. A gorgeous remix from Daniel and the perfect way to close out another great release on Specific Music. Don’t miss it.